Huawei has sought to repair its image in the US through a full-page advert in the Wall Street Journal, which says: "Don't believe everything you hear." In an open letter, executive Catherine Chen invited US media to visit the firm to clear up "misunderstandings" created by the US government. The US has been pressuring its allies to shun Huawei equipment on the grounds of national security. Some governments have done just that, putting the firm on the defensive. "I am writing to you in the hopes that we can come to understand each other better. In recent years, the US government has developed some misunderstandings about us," Ms Chen, director of the board at Huawei, said in the letter. The advert, posted on Twitter by a Wall Street Journal reporter who covers cyber security, invited members of the US media to "visit our campuses and meet our employees". "Don't believe everything you hear. Come and see us. We look forward to meeting you," it said. This is not the first time Huawei has tried to change its image in the West. It recently sought to appeal to New Zealand's love for sport by placing advertisements in two major newspapers and on billboards. "5G without Huawei is like rugby without New Zealand," the ad read. Why is Huawei doing this? Chinese telecoms giant Huawei has been the focus of intense international scrutiny lately, with several countries raising security concerns about its products. Australia, New Zealand, and the US have already banned or blocked Huawei from supplying equipment for their future 5G mobile broadband networks. The US is also pursuing criminal charges against Huawei and its chief financial officer Meng Wanzhou, including money laundering, bank fraud and stealing trade secrets. 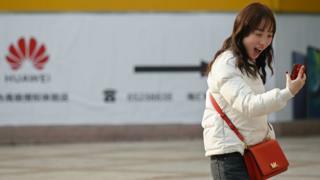 Huawei denies any wrongdoing and its founder Ren Zhengfei recently told the BBC that his daughter's arrest was politically-motivated. Canada has until the end of Friday to decide whether to authorise the start of a formal extradition hearing against Ms Wanzhou. Not all countries are succumbing to the pressure, however. UK cyber-security chiefs recently determined that any risk posed by involving Huawei in UK telecoms projects could be managed. Recent comments by Mr Trump were also interpreted as him taking a softer stance on the firm. He said he wants the US to become a technology leader through competition rather than by blocking others, without specifically mentioning Huawei.